and notes with you everywhere you are. Even add a new job on the go! See where you need to be and when you need to be there. New timelines to keep your organized. Never be without your data again. Get directions, see all of your contacts and check your calendar! For iPhone and Android devices. Your to-do list and workflows all in the palm of your hand. Never forget an important task again. Stay more organized than you’ve ever been. Call, email or text your clients whenever you like. All the right information where you need it. When you need it. 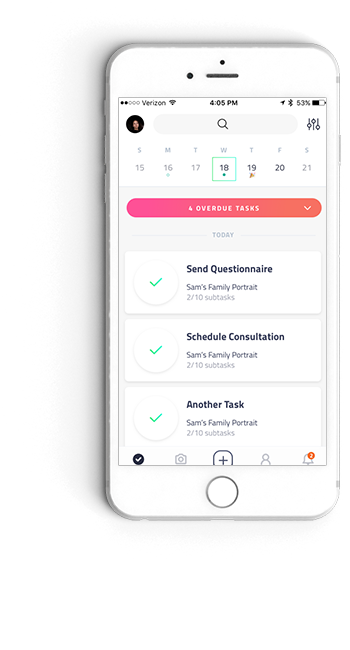 Synch with all of your calendars so you can respond to inquiries faster and book more jobs sooner. Look more professional with ShootQ.